Sasuke, from the day he was born, was driven by pressure and expectations. Born as a member of the prestigious Uchiha clan, most of his childhood was lived in the shadow of his older brother, Itachi. His father seemed to favor Itachi, although his mother confided to him that she always heard him praising Sasuke out of earshot. Even so, the drive to be as good as or even surpassing Itachi caused Sasuke to grow up as a fine young ninja, admired by all the girls around him for his looks, skills and cool attitude. Sasuke’s happiest moment came when he finally mastered the Goukakyuu, a flame-breathing technique. The Uchiha clan’s symbol, a fan (Uchiha is alternate way of spelling Uchiwa, which means fan) represented fanning flames. Mastery of a fire technique by a child was seen as a rite of passage and progression to adulthood. However, soon after, tragedy struck. Sasuke returned home one evening after a day at the academy to find nothing but corpses in the compound of the Uchiha clan. Not a single person was left alive, even the elderly slaughtered. When Sasuke finally plucked up the guts to pull open the door to his own home, his fears were realized as he saw the bodies of his parents on the floor, with a third figure in the background. As the mysterious person advanced forward, Sasuke recognized him – it was his brother, Itachi. Thinking Itachi had done battle with the murderer and slain him, Sasuke rushed forward, yelling about the other murders, when Itachi suddenly cut him. With the coldness of an iceberg, Itachi unleashed a new ability – Mangekyou Sharingan. The Sharingan was a special ability of the eye unique to the Uchiha clan, but Itachi had triggered an even more potent form of it. Looking into Itachi’s eyes, Sasuke was shown the events as though they were videotaped, with Itachi mercilessly and indiscriminately butchering the entire clan, ending with his own parents. Sasuke collapsed into a puddle of his own drool, mentally crippled from the shock and unable to take the revelation. Itachi gave him words to live his life by. “Foolish little brother… if you want to kill me, hate me. Detest me. Run, run away and live in an unsightly way.” However, Sasuke wasn’t done yet. Itachi had one more thing to reveal to him, telling him to investigate a scroll hidden away in a place in the Uchiha compound. After that, Sasuke grew up with only two things in mind: First and foremost, vengeance against Itachi for the genocide. Secondly, the revival of that clan. Sasuke made no secret of his plans, even when he was introduced to his three-man cell of himself, Naruto Uzumaki and Sakura Haruno, led by the Jounin, Kakashi Hatake. His single-minded determination and exclusive drive led him to develop a superiority complex, respecting few and holding himself in an elitist view. Turning down the affections of Sakura and taking enjoyment from calling Naruto “dead last” due to his grades, he even took liberties with how he conducted himself around Kakashi. His first major mission was escorting an architect and bridge expert, Tazuna, to his home in the poverty-stricken Wave Country. Sasuke showed exceptional skill when attacked by two Chuunin-level ninja from Hidden Mist village. Later on in the same mission, during an exercise to improve tree climbing, he managed to stay ahead of Naruto for a good length of time. 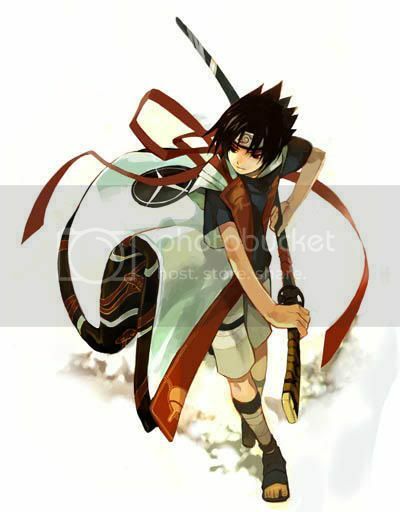 He also stood toe to toe for a while with Haku, an exceptionally dangerous ninja with extreme speed and dexterity. It was during this battle that Sasuke awakened the legacy of his clan, the Sharingan. Sasuke’s life would be changed forever when he took part in the Chuunin exam. During the physical test, he faced an unknown opponent that totally overpowered the whole team and finished by leaving Sasuke with an odd marking on his neck and shoulder area. He left, declaring his name to be Orochimaru and that Sasuke would eventually seek him. Sasuke fell into a deadly and painful sleep, barely kept alive by Sakura’s efforts. However, as another 3-man cell closed in on them, Sasuke’s timely awakening brought a frightening revelation; the mark had expanded, covering one side of his body in a black flame pattern and granting him purple aura of power. In a matter of minutes, Sasuke had gone from motionless to an avenger, yanking the arms out of the sockets of one attacker and scaring his teammates off. The power he now had command over even went as far as to make Sakura afraid, begging him to stop. In the preliminary exams, the mark proved to carry several strings attached. It wanted to activate and expand several times, forcing him to be aggressive and causing him pain. Sasuke had to rely on innovation to survive, utilizing the Sharingan’s unique copying ability to adapt one of Rock Lee’s own techniques to suit himself. Orochimaru, watching in disguise, looked on with glee. Immediately after, Kakashi escorted Sasuke to a location away from the arena to suppress the mark, or “Cursed Seal”. However, Kakashi could not purge it completely, only allowing enough protection to stop it spreading involuntarily. The barrier was only as good as Sasuke’s own willpower, though. Kakashi took another precaution with Sasuke, personally tutoring him upon witnessing the abilities of Sasuke’s next opponent, Gaara of the Desert. Sasuke kept up his rebellious attitude, making a last-second arrival for his match. Gaara enclosed himself in a protective shell, forcing Sasuke to use the move Kakashi had spent a month teaching him – a thrusting strike enveloped in chakra that screeched with a noise like a thousand birds flying when the blow was delivered, giving it the nickname Chidori (Chidori means One Thousand Birds in Japanese). It penetrated the shell and for the first time in his life, Gaara saw his own blood. The shock drove the already unstable Gaara over the edge and his siblings carried him away. Sasuke gave chase as in invasion from the forces of Hidden Sound, backed up by Sand’s soldiers, swarmed in. Sasuke pursued Gaara and dispatched his sister, Temari, but when Gaara recovered, he was more of a monster than Sasuke could handle, forcing Sasuke to release the Cursed Seal in order to keep up with Gaara. Even so, Sasuke still fought a slowly losing battle against the maniacal ninja, who now resembled more of a demon than a boy. For the second time, Naruto succeeded where Sasuke had failed, where Naruto first defeated Haku’s death trap and rescued them. The events to come in the following weeks would re-shape Sasuke’s life forever. The criminal organization, Akatsuki, infiltrated Hidden Leaf seeking Naruto. The pair that visited was composed of an ex-Hidden Mist assassin, Kisame Hoshigaki and the ex-Hidden Leaf mass murderer… Itachi Uchiha. When Sasuke caught word of the event, he raced to find Naruto before Akatsuki did. Sasuke burst in on them before they abducted Naruto, with his life’s goal in front of him. Racing at Itachi with a Chidori so intense it peeled the skin from his hand, he was in denial as Itachi simply swatted the killing blow aside and proceeded to beat Sasuke’s will out of him, telling him he still didn’t hate and loathe enough and that he wasn’t willing to take the extra step. As further “encouragement”, Itachi used the technique Tsukiyomi, part of the Mangekyou Sharingan’s abilities, to make Sasuke re-live the murder of their parents at Itachi’s hands over and over in a loop, a nightmare which he couldn’t awake from for what was three days in his mind. Sasuke was incapacitated and didn’t recover from the experience, lying comatose in a hospital for a long time. When he finally awoke, he was visited by Sakura and Naruto, shoving Sakura aside and demanding a battle with Naruto. No punches were pulled during the battle and Naruto threw many clones against Sasuke. Sasuke was launched into the air so he unleashed a fireball to wipe many of them out. But as the smoke cleared, Naruto formed Rasengan to strike the falling Sasuke. Sasuke answered with Chidori. Sakura threw herself between them, with Kakashi saving her by redirecting their strikes at a pair of twin water towers. Sasuke smirked at the “entry wound” his Chidori had caused in comparison to the size of Naruto’s, but was left feeling humiliated again when he saw the “exit wound” of the tower was far bigger than the one Chidori made. Kakashi soon warned him about what Chidori was taught to him for. Sasuke yelled back, justifying himself by asking Kakashi how he’d react if Sasuke suddenly murdered people close to him. Kakashi cheerfully replied that everyone close to him was already dead. The very same night, Sasuke was visited by Orochimaru’s personal representatives, The Four Sounds. After suffering another humiliating defeat by their leader, Sakon, Sasuke activated his Cursed Seal and attacked. He was knocked back just as fast, as Sakon revealed that he was not unique in receiving the seal, nor was it the limit of the seal’s power. Sasuke was left the option of joining them and siding with Orochimaru, or staying and being weak in Hidden Leaf. With the memory of his loss to Itachi and his inferiority to Naruto fresh in his mind, Sasuke marched under the moonlight to the gate of the village. Sakura blocked his path and tearfully begged him not to leave, spilling her emotions to him and confessing her love. Sasuke, with a smirk, told her she was as annoying as ever and knocked her out, turning his back on her and the village. Sakon explained to Sasuke that the seal would eventually grow naturally and grant him stronger power, but there was a way to speed up the process. However, the accelerated growth rate would prove too much for him and kill him, so they would provide a barrier that would merely cause him to fall into a coma for a number of hours. The awakening from it would be like the first time he woke up with the seal activated. Agreeing, Sasuke swallowed the pill Sakon gave him and fell unconscious, where the four placed him inside a casket and sealed it up with a powerful barrier spell. By this time, Sakura had alerted Hidden Leaf of his defection and a rescue party had been organized. With backup from Hidden Sand as a debt repaid, Hidden Sound’s escorts were defeated, but Sasuke had already burst free from the casket, with Naruto following him to the border of the country. Sasuke awoke, with Naruto on his back and helpless. However, before he delivered the killing strike, he realized that he was simply obeying Itachi like a puppet. Instead, Sasuke left Naruto and continued on foot to Orochimaru’s location, proclaiming that he would seek power in his own way, spiting Itachi. As Orochimaru predicted, Sasuke came to him for power. However, Sasuke was unaware that Orochimaru was not training him for free, as Orochimaru desired the Sharingan for himself and planned to possess Sasuke’s body. An earlier complication meant that Orochimaru would have to wait around three years before he could possess Sasuke. In all likelihood, Sasuke would sink to any depth to accomplish his goals, even allowing Orochimaru to take over his body once he had killed Itachi. Over the following years Sasuke studied under Orochimaru's tutelage, greatly increasing his skill level. He would adopt the elite Sound foot soldier style of dress and also begin to wield a sword. When Orochimaru and Kabuto left their compound to kill Sasori, he chose to remain behind and wait patiently for Orochimaru to return and train him further. The duo returned with Sai, who had been secretly ordered to assassinate Sasuke by ANBU Root leader Danzou. Sai had other ideas though, he was determined to get Sasuke to return to Konoha and rejoin his friends. Sai had been changed by Naruto and he was determined to help his teammate save Sasuke. Sasuke would have none of this though and destroyed the room to get better freedom of movement. He was then to see his second surprise, Naruto and Sakura, who had journeyed to the compound to save him. Sasuke mocked Naruto and stated he didn't kill Naruto before on a whim, but he will do so now for that same reason. A determined Naruto merely acknowledged that to live up to his own dreams, he can't lose to Sasuke again. Sasuke goes for a killing blow but Sai moves to stop him. Sasuke then used his new Chidori Nagashi move to stun everyone. As he stares at Naruto we learn he too can now see the Kyuubi Prison. Inside Naruto, the demon offers his surprise at seeing one from the cursed bloodline again. He states he hasn't seen someone like that since Uchiha Madara, but Sasuke doesn't recognize the name. Back in the real world team leader Yamato attempts to imprison Sasuke, but he cuts through the barrier. He moves to finish them all off but Orochimaru arrives and stops him. The Sound trio then take their leave, and Naruto is left having failed to save his friend once again. Over the next month, Sasuke’s skill grew to levels where he could eventually engage small armies of ninja in combat and drop them without a fatal move. Orochimaru came to acknowledge that even as a boy, he was nowhere near the level Sasuke was at currently. However, Sasuke grew frustrated as Orochimaru also told him he lacked a certain kind of ruthlessness. Later, as Orochimaru lay in bed, weakened, Sasuke cut down his door and attacked him with a new technique, shaping the energy from Chidori into a long blade. Sasuke announced his intention to demonstrate the ruthlessness he knew by killing Orochimaru, since even the legendary ninja no longer had anything left to teach him. As Sasuke prepared a fatal blow, Orochimaru spat something out behind Sasuke, who turned to see his real opponent. Behind him was an amalgam of writhing white serpents, terminating in a giant head resembling Orochimaru’s and topped with messy black hair. The experiments he had performed had made Orochimaru lose his human shape, forcing the need to transfer into Sasuke instantly. Orochimaru’s resilience and resistance to injury forced Sasuke to use the Cursed Seal at level 2, taunting Orochimaru about how worthless he was before an Uchiha and how the only way that a snake like him would ever rise into the sky is in the talons of a bird of prey. With that, he sliced Orochimaru’s body up, seemingly killing him. A moment later, he began to feel dizzy. Orochimaru’s decapitated head gloated at how the poison of the snake was vaporous, then lunged forwards, as if to devour Sasuke. Next, Sasuke found himself in what appeared to be a fleshy landscape where Orochimaru sat inside a clump of tissue, near several others which bore the faces of his previous host bodies. Orochimaru informed him that it was the dimension where he transferred himself into his new hosts as the floor began to turn into snakes and swarm around and over Sasuke. However, Orochimaru found himself trapped in a paralyzing Genjutsu as stone stakes drove into and around him. Sasuke retorted that the Sharingan eye would make every technique used against it fail, and then began to turn the dimension against Orochimaru, consuming him and reversing the technique. Kabuto, alerted to the fight, ran to see what had happened. Upon discovering the body of Orochimaru, Sasuke used the Sharingan to display what had happened. Suspecting Orochimaru’s death initially, Kabuto’s fears were denied as Sasuke stated “I’ve taken over”. Sasuke then set about gathering key personnel who either served Orochimaru or were his captives - the heir to the Mist’s Seven Swordsmen, Suigetsu, a man with a watery body; Karin, a jailer for Orochimaru with the ability to locate people by detecting their chakra signature; then Juugo, a psychologically unbalanced individual who came to Orochimaru for help but became exploited for his body’s mutative mechanisms, which would eventually be harvested, cultured and custom modified into what was now known as the Cursed Seal. Despite the reactions from his new recruits - Suigetsu’s arrogance, Karin’s affection and Juugo’s murderous instability - he managed to convince them into becoming a unit with a goal in mind, to track down Itachi and finally kill him. Using Karin as a guide, Sasuke tracked him down but eventually separated from his team, running into Akatsuki members Deidara and Tobi. Sasuke first lunged at Tobi and delivered what appeared to be a fatal strike. Tobi got up, shaken and scared but unharmed. Deidara toyed with Sasuke, using his lowest level of explosives first but found out that Sasuke's speed was greater than he imagined. Deidara then upped the ante with a huge dragon, with Tobi supporting through landmines. Once again, Sasuke comes out on top by using his second stage of the Cursed Seal's release to take to the air. Although Deidara managed to cause an explosion that tore Sasuke's wing off, Sasuke soon retaliated by using his own sword as a launch pad, shredding the wing from Deidara's dragon and using a shuriken attached to wire to plunge Deidara into his own minefield. Enraged and wounded, Deidara began to lose his confidence. He ascended in air on a clay bird and then spewed out a gigantic version of himself, which burst into thin air; screaming in victory as Sasuke began to be eaten away. The new attack actually released countless miniscule explosives that take the body apart on a cellular level. However, his victory was short-lived as he found out the dissolving Sasuke was the result of a Genjutsu illusion. The real Sasuke was holding him in place with a Chidori and seeing his attack through the Sharingan identifying the chakra within. As Sasuke planned to interrogate Deidara, he was suddenly trapped by the real Deidara who emerged out of the bird to pin him. Deidara revealed a previous encounter with Itachi forced him to train in Genjutsu resistance in one eye. Sasuke was then pulled into another trap of Deidara's, which surrounded him with clay. As Sasuke saw his tomb with the Sharingan, Deidara lamented his low chakra and ever-decreasing arsenal. Suddenly, Sasuke ripped out of the clay structure and moved to land another Chidori. In response Deidara made another huge explosion and resulting in both he and Sasuke landing hard on the ground, allowing Deidara to apparently win. However, Sasuke turned out to be alive and well again, explaining his resilience – Deidara's hand seals all revealed his jutsu to be Earth elemental, all weak to lightning; Sasuke's forte. When hit by the electricity from Sasuke's arsenal of Chidori variants, every single bomb became defused. Deidara launched one final attack, the most powerful yet seen. Stripping his clothing from his chest, revealed another mouth, sewn shut. Painfully removing the lacing that kept it gagged, Deidara stuffed a huge chunk of his clay into it and vein-like darkened patterns began to spread out over his body. The mouth began to take on a life of its own and light erupted violently from it and Deidara became his own idealized form of art, an explosion that seemed inescapable. Sasuke barely made it out alive, summoning Orochimaru's familiar, Manda, forcing him into submission through Genjutsu and hiding inside his body. When the explosion was over, Suigetsu summoned Manda and Sasuke slid out of his charred hide. Manda, while mostly intact physically, had taken too much damage to go on living and cursed Sasuke with his dying breath. Team Snake then rested up for a short time, with more of the usual antics – Suigetsu arguing with Karin, who continued her plans to get an intimate moment with Sasuke, even going as far as using their money for supplies on perfume and plotting to have her way with him as Suigetsu and Juugo slept. During his time resting, Sasuke mused to himself that by counter-absorbing Orochimaru, he'd also gained the resilience that granted Orochimaru his vitality. Their downtime was short-lived, however, as Karin detected the incoming party from the Leaf village. Sasuke chose to ignore them and continue for Itachi. Karin and Juugo also prepared a diversionary tactic to slow Leaf down by scattering some of Sasuke's clothing, which Akamaru was homing in on through smell. Sasuke’s pursuit finally lead him to Itachi, where the two engaged in battle after some nostalgic small talk. Sasuke quickly gained the upper hand and dropped Itachi quickly with yet another variant of Chidori. However, Itachi's body appeared to have been another illusion and dispersed into a murder of crows, telling him their fight would conclude on more familiar turf, another compound used by the Uchiha. As Sasuke resumed his chase, he ran into one of Naruto's copies tracking him. Without hesitation, he pierced it with Chidori, commenting that Naruto never gives up. By this point, it can be claimed that Sasuke's mastery of Chidori is absolute, now able to be shaped into a sword that can split into multiple blades, shoot a small needle-like projectile, expand it as an offensive and defensive electrical field and be used more times than his original limit of two times per day. His control over the Cursed Seal is also on a level with the seal's original progenitor, Juugo, being able to partially transform himself to the second stage without engaging the full release. His power is easily comparable with Kimimaro as a single stare will intimidate Juugo into abandoning his murderous rages. In addition to these impressive powers, he has the regenerative properties of Orochimaru's experiments, substituting the torn and tattered part of his damaged wing in the fight with Deidara with them. Most disturbing of all, though, is his disregard to his former friend, using a lethal strike on him without a second thought. Orochimaru once claimed Sasuke lacked ruthlessness – the spontaneous Chidori finally proves once and for all Sasuke's training with him is complete, even though he acknowledges that he killed Orochimaru in a weakened state; a true act of ruthlessness indeed.